Although recovery of renal functions in dialysis dependent patients is estimated to be greater than 1%, there are no indicators that actually suggest such revival of renal function. Residual renal function in dialysis patients is unreliable and seldom followed. Therefore renal recovery (RR) in dialysis dependent patients may remain unnoticed. We present a group of dialysis dependent patients who regained their renal functions. The aim of this project is to determine any indicators that may identify the recovery of renal functions in dialysis dependent patients. All the discharges from the chronic dialysis facilities were identified. Among these discharges deaths, transplants, voluntary withdrawals and transfers either to another modality or another dialysis facility were excluded in order to isolate the patients with RR. The dialysis flow sheets and medical records of these patients were subsequently reviewed. Eight patients with a mean age of 53.8 ± 6.7 years (± SEM) were found to have RR. Dialysis was initiated due to uremic symptoms in 6 patients and fluid overload in the remaining two. The patients remained dialysis dependent for 11.1 ± 4.2 months. All these patients had good urine output and 7 had symptoms related to dialysis. Their mean pre-initiation creatinine and BUN levels were 5.21 ± 0.6 mg/dl and 72.12 ± 11.12 mg/dl, respectively. Upon discontinuation, they remained dialysis free for 19.75 ± 5.97 months. The mean creatinine and BUN levels after cessation of dialysis were 2.85 ± 0.57 mg/dl and 29.62 ± 5.26 mg/dl, respectively, while the mean creatinine clearance calculated by 24-hour urine collection was 29.75 ± 4.78 ml/min. One patient died due to HIV complications. One patient resumed dialysis after nine months. Remaining continue to enjoy a dialysis free life. RR must be considered in patients with good urine output and unresolved acute renal failure. Dialysis intolerance may be an indicator of RR among such patients. Although guidelines for the initiation of hemodialysis in End Stage Renal Disease (ESRD) patients are clearly laid out, little is known about the indicators of Renal Recovery (RR) for the cessation of dialysis either on a temporary basis or indefinitely. Although there are studies citing recovery of renal function in dialysis dependent patient, but the indicators or pointers to such recovery is not elucidated. We identified eight patients who were declared dialysis dependent and were initiated on maintenance hemodialysis. Later, these patients were noted to have either complete or partial recovery of renal functions, and were taken off dialysis. The aim of this paper is to emphasize the need for watchfulness in assessing RR in patients who are declared to be dialysis dependent. We also attempt to identify the factors that may predict or alert a clinician to the possibility of RR that is sufficient enough for the cessation of maintenance dialysis. We identified all patients who were discharged from our chronic dialysis facilities. Deaths, transplants, voluntary withdrawals and transfers to other modalities or dialysis centers were identified and excluded. The medical records of the remaining patients were reviewed, and the symptoms on dialysis, interdialytic weight gains, pre dialysis and post dialysis serum chemistries such as BUN, and creatinine were recorded. Creatinine clearance if determined prior to initiation of dialysis was noted. A note of the symptoms on dialysis such as hypotension, muscle cramps, lethargy and extreme weakness after dialysis was also made. The previously recorded follow-up chemistries and symptoms after the cessation of dialysis if any, was documented. Outcomes of death, return to dialysis, and duration of dialysis-free time was recorded. A total of 8 dialysis patients over the preceding three years who had recovered their renal function were identified (Table 1). Table illustrating the characteristics, clinical course and outcome of the 8 patients presented in the study. 1 Died of HIV compl. Washed out, cramps Low BP. In the preceding 3 years we identified 8 patients in our two chronic dialysis facilities who had renal recovery following the discontinuation of dialysis (either on a temporary or an indefinite basis). Our chronic dialysis units have an incident patient population of approximately 25 patients per year, and a prevalent population of approximately 150 patients. The annual growth rate is approximately 7%. Among the 8 patients that recovered their renal function, 3 were Caucasians, 3 African Americans, 1 Hispanic and 1 Asian. Five were male and three female. The mean age of these patients was 53.87 ± (SEM) 6.7 with a range of 31 years to 81 years (Table 1). Four of these patients had an underlying glomerulopathy, and two had hypertensive glomerulosclerosis. Two patients had HIV disease, one patient had probable cholesterol embolization and one patient had ischemic nephropathy sustained during the removal of a kidney that had a cancerous growth. Six patients had symptoms attributed to uremia, 2 patients also had acidemia and hyperkalemia and 2 patients had fluid overload in the form of either resistant anasarca or pulmonary edema. Their mean BUN and creatinine was 72.12 ± 11.1 (range 25 – 121) mg/dl and 5.21 ± 0.6 (range 3.3 – 8.6) mg/dl respectively. These patients remained on dialysis for a mean of 11.13 ± 4.0 (range 2–30) months. It was unclear if the patients had good urine output at the time of dialysis initiation. However, all the patients vocalized an increment in urine output while on dialysis, and two patients had to frequently interrupt the dialysis session to pass urine. Seven of these patients were consistently symptomatic during the dialysis session. All seven patients had severe leg cramps, and 5 had a washed-out feeling after dialysis and felt better on the non-dialysis days. These seven patients requested a reduction in either their dialysis treatment time or the frequency of dialysis. Patients also had episodes of nausea, vomiting, and hypotension during dialysis. Their mean serum creatinine and BUN levels at the time of cessation of dialysis were noted to be 2.85 ± 0.5 (range 1.71 – 6.34) mg/dl and 30.86 ± 4.5 (range 14 – 48) mg/dl, respectively. Since these patients' creatinine levels were not in a steady state at the time of initiation, creatinine clearance was not determined by using 24-hour urinary creatinine excretion. After the cessation of hemodialysis, the patients were followed on a weekly basis in the nephrology clinics and their creatinine clearance was determined by 24-hour urinary creatinine excretion once the creatinine had stabilized. The mean creatinine clearance determined by 24-hour urinary creatinine excretion was 29.75 ± 4.8 (range 9 – 51) ml/min. Of the 8 patients, three insisted to be taken off dialysis. These patients remained dialysis free for a mean duration of 19.75 ± 5.6 (range 1 – 51) months. One patient with HIV disease that was complicated by disseminated MAI infection and CMV retinitis infection died 1 month after discontinuation of dialysis due to infections. His creatinine clearance after the cessation of the dialysis was estimated to be 53 ml/min. One patient, whose creatinine clearance was 9 ml/min, and who remained without dialysis for nine months, had to be restarted on dialysis due to progressive loss of weight and appetite. His creatinine clearance remains at 9 ml/min. It is interesting to note that 6 of the 8 patients had a renal biopsy performed and 5 of these 6 patients with renal biopsy had focal segmental glomerulosclerosis (FSGS) as the primary glomerular disease. Although they all may have had acute renal failure in the setting of chronic kidney disease (CKD) they all were assumed to have renal failure secondary to their primary glomerulopathy. Although there are guidelines for the initiation of hemodialysis and for the care of patients on maintenance hemodialysis and peritoneal dialysis, there is very little in the literature regarding the recovery of renal function. This is mainly because renal failure patients who are labeled as dialysis dependent rarely regain their renal function. Even when they do, it may not be clinically evident, and such marginal renal recovery hardly justifies cessation of dialysis. There are case reports that cite delayed recovery of renal functions in dialysis dependent patients who have had ischemic nephropathy secondary to renal artery stenosis. When the renal artery occlusion to the solitary kidney was surgically repaired as late as six months after initiation of dialysis, the patient showed recovery of renal function . Kato and his colleagues have reported recovery of renal function in their dialysis dependent patient who had cholesterol embolization to the kidneys causing loss of renal functions , while Morales and his colleagues reported spontaneous recovery of renal function in their patient who supposedly had renal failure due to FSGS associated with human immunodeficiency virus (HIV) infection . Both of these conditions are widely believed to cause irreversible renal failure. Urologic conditions such as inadvertent ligation of the renal vein of a single functioning kidney and chronic obstructive uropathy due to chronic ureteric obstruction especially in a single functioning kidney, can also reveal evidence of delayed resolution of renal failure upon relieving the obstruction, as cited by Cancarini and Shokeir and their colleagues [4, 5]. Alkhunaizi and his colleague reported a case of acute renal failure due probably to secondary oxalosis related to excessive ingestion of vitamin C. Their patient also had delayed renal recovery, which they attributed to slow removal of oxalates by aggressive hemodialysis . Probably the most reported dialysis dependent cases that eventually regained renal functions are vasculitis related acute renal failure patients and those with accelerated hypertension, who were later noted to have an adequate amount of renal functions to evade dialysis therapy [7–9]. Sekkarie and colleagues reviewed 10-year data of 7404 patients from the Michigan Kidney Registry to evaluate the rate and associated factors for recovery of renal function. They observed that in patients with glomerulonephritis associated with a systemic illness, vasculopathies had threefold to fourfold higher recovery rates. White race, older age, and later year of ESRD were associated with significantly higher recovery rates. They also observed that in approximately 48% of those who regained renal function, recovery occurred within 6 months of initiating dialysis therapy, 74% within 1 year, and lasted at least 1 year in 75% of such cases . However, they did not allude to the factors that forewarned the physicians about recovery of renal function. These authors cautioned the physicians to be vigilant before declaring them as having ESRD. Spanish medical literature, however, addresses the issue of recovery of renal function. Two different authors proposed periodic monitoring of residual renal functions at least once in two months [11, 12]. In the United States, in contradistinction to the peritoneal dialysis patients, residual renal function in hemodialysis patients is usually not monitored. In our hemodialysis facilities, urine output is neither routinely measured nor residual renal function estimated. The only indication that alerted the physician was marginal decrement in the pre-dialysis serum creatinine in a patient who requested reducing the treatment time due to intolerance to dialysis procedure. All except one of our patients had symptoms on dialysis such as nausea, vomiting, hypotension and leg cramps. In our institution approximately 1% to 2% of the patients recover renal function. This may be an underestimation because only those patients who had severe symptoms on dialysis and requested a reduction in dialysis time, prompted us to re-evaluate their renal functions. Most of the symptoms are presumably secondary to excessive ultrafiltration on dialysis. There probably are more patients who are not subjected to significant fluid removal during dialysis, and therefore may not exhibit symptoms on dialysis. Such patients may continue to receive dialysis for undetermined period of time that they do not need. Our second patient may be a representation of such group. Six of the 8, i.e. 75% percent of our patients who came off dialysis had a glomerulopathy listed as the cause of renal failure, which is supposedly an irreversible cause of renal failure. Clearly, these patients may have had an acute component of renal failure that either was ignored or was considered to be irreversible. One might argue that during multidisciplinary mandatory monthly patient care conferences (PCC), the decreasing values of BUN and creatinine should attract the attention of the caregivers to the possibility of RR. However, this does not seem to be the case as low BUN and creatinine can also be attributed to worsening of nutritional status. This may be perceived to be due to under-dialysis that may prompt even more aggressive dialysis that the patient does not tolerate. In some instances, such as our last patient, the creatinine may start to fall precipitously only after the cessation of dialysis. This possibly could not be evident until the dialysis was withheld. All these patients explicitly expressed a significant improvement in their quality of life after the cessation of dialysis. The most significant difference was observed in patient number four, who despite his GFR being less than 10 ml/min, could not tolerate hemodialysis session. He remained most symptomatic immediately following dialysis, experiencing better health the following day, but again cyclically worsening after dialysis. He remained off-dialysis for only 9 months but enjoyed his dialysis-free life during these 9 months. Although most of these patients had such symptoms for several months, their residual renal function was never estimated, and even if it were, that would not have made much difference because there are no guidelines for the interpretation of these results. The creatinine if not in a steady state, cannot be used for creatinine clearance utilizing the conventional formulae. The Cockroft and Gault formula, employing the predialysis serum creatinine, has its own limitations. In addition, progressive decline in serum creatinine is an independent indicator of poor nutritional status . This, as mentioned earlier is often attributed to inadequate dialysis, and the patient therefore can be subjected to more aggressive dialysis, which is poorly tolerated and can make the patient more miserable. Approximately 1% to 2% of the patients declared to have end stage renal disease has significant recovery of their renal function and is taken off dialysis schedule. More patients may have a potential for recovery of renal function that could be missed. There are no guidelines to monitor residual renal function. Additionally, many patients with various glomerulopathies with chronic kidney disease may develop acute renal failure and get erroneously labeled to have "reached ESRD" and become dialysis dependent. Once these patients even partially recover their renal function, they tend to develop symptoms such as muscle cramps, hypotension and tired or "washed out" feeling following their dialysis sessions. These patients then either tend to skip the dialysis sessions and/or reduce the dialysis time. We recommend that residual renal function be checked in all dialysis patients who are not anephric, and those who are symptomatic on dialysis with good urine out-put. These patients should be evaluated periodically for possible recovery of renal function. 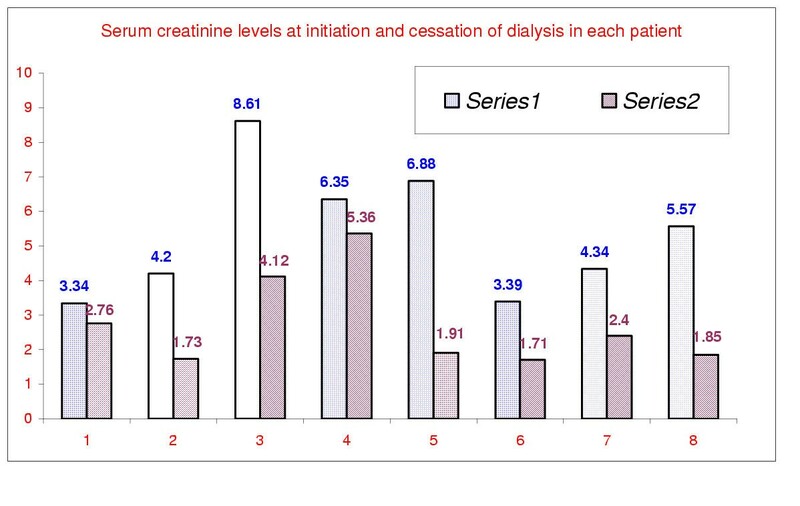 Bar diagram depicting the level of serum creatinine in each patient at the time of initiation and cessation of maintenance hemodialysis. Series 1 represents the serum creatinine in mg/dl at initiation of dialysis and series 2 at discontinuation of hemodialysis.